OCRAFOLK FESTIVAL 2019 EARLY BIRD TICKET SALES ARE OPEN THROUGH APRIL 30, 2019! 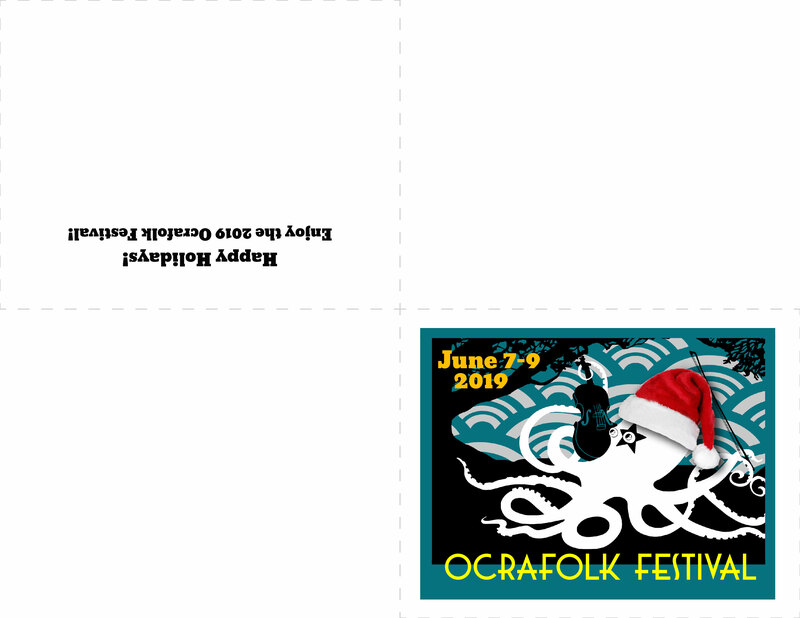 GIVING OCRAFOLK TICKETS AS A HOLIDAY GIFT? PRINT OUT THIS CARD TO GIVE TO YOUR SPECIAL FOLKIE! The price for weekend passes will increase to $65 after April 30th will receive a complementary 2019 Collector's Button good for participating in stage drawings. CHILD/STUDENT TICKETS 17 YEARS AND YOUNGER ARE FREE IN 2019! You may reserve your Child/Student Tickets Online, or get them when you pick up your tickets. Child/Student Tickets are clearly labeled and will not be usable by adults. The Child/Student must be present at ticket pickup and wristbands must be put on at ticket booth. Single Day Passes to the Ocrafolk Festival will be released online at a later date. If you are planning on attending two days of the festival weekend, it will be less expensive to purchase the Early Bird All Weekend Ticket Pass than separate day passes. YOU MAY PURCHASE TICKETS ON SITE AT THE FESTIVAL BOX OFFICE, JUNE 7-9 2019. All Weekend Passes on site will be $65. About ~ Ocrafolk Festival features musicians, storytellers, artisans, and characters of Ocracoke Island, Eastern Carolina, and beyond. This magical celebration reflects the unique nature of this remote "Pearl of the Outer Banks,"(Ocracoke Island is only accesible by ferry, and features a close-knit year-round community of 1000, and the most beautiful undeveloped 13 miles of beach that you will find anywhere on the US east coast). Featuring 3 days chocked full of performances and events, kids activities, a squaredance, workshops, food, and artisans, the Ocrafolk Festival will make you feel right at home. Best of all, your ticket fee supports kids and community programming on the island. Your only question upon departure . . . "How soon can I return?" 2019 Performers include: Molasses Creek (your hosts), Donald Davis, the Steel Wheels, Mipso, Kaira Ba, Aaron Burdette, Chatham Rabbits, Beleza, Craicdown, Noah Paley, Bill Harley, Martin Garrish, Coyote, The Wilders, Paperhand Puppets, Mahalo Jazz, Warren, Bodle & Allen, Bob & Jeanne Zentz, Green Grass Cloggers, John Golden, Rodney Kemp, Jef the Mime, Ballet Folkorico de Ocracoke, and more! Your ticket to the festival doesn't just purchase your admission this year. It supports arts programming for Ocracoke children. It funds our theatres and visiting/local musicians. And it supports cultural diversity in our community. Ocracoke Alive's mission is to enrich Ocracoke Island by encouraging and sponsoring cultural activities. We appreciate you, our festival family, for the love and excitement you have brought to our festival over the last 19 years. Tickets to the Ocrafolk Music and Storytelling Festival can be purchased online here or at the festival box office June 7th-9th. If you are interested in working with us at Ocrafolk, stay tuned for information about volunteering. If you would like to help sponsor Ocrafolk, click HERE (SPONSOR) to learn more about sponsorship opportunities. Festival information ~ Find more details online at www.ocracokealive.org.